When I started making lots of quilt tops and couldn't keep up with the quilting on the domestic sewing machine. I went looking for alternatives and started renting long arm at my LQS: Bits N Pieces. Liz the owner of the shop and her daugher Alyssa are just awesome! This is going to be series of posts to getting started with longarm who have already experience with free motion quiliting on the home/domestic sewing machine(HSM/DSM). I will be sharing my experience transitioning to long-arm and some helpful hints so that you don't make the same mistakes as I did. 1. Square up your quilt top, trim all the threads so that it doesn't get caught up while quilting. 2. Your batting should be at least 3 inches longer and wider than your quilt top. 3. Backing should be at least 4 inches longer and wider than quilt top. Preferably 6 inches is good. 4. Square off the top and bottom of the quilt backing so that its straight of grain. This year LQF(Lowell Quilt Festival) has invited BMQG again for a special Modern quilts exhibition. And I am planning to submit couple of quilts for the show and also participating in our Mini quilt challenge. Got my Indian Summer baby quilt all bound. Now linking up to Lee's W.I.P. Wednesday@FreshlyPieced blog. I had finished this quilt top last year in fall. And has been sitting in the closet for a long time. I finally got to quilt this on the longarm this week. The fabric line is Indian Summer by Riley Blake designs. I was finally able to figure out a setting on the long arm to get my quilting curves back. 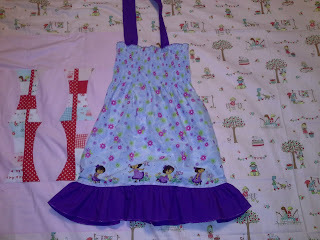 I still love quilting on my DSM but I have so many quilt tops it would take me for ever to quilt them at home. That's the reason I love using the longarm to get things done faster, but I still would like them look nice. Soon I will be sharing up tips on getting started on the longarm. 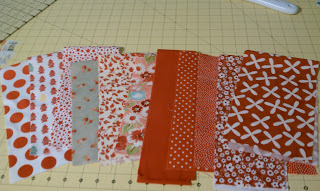 Sometimes its just a matter of figuring out what settings works best for our quilting skills and the FMQ design. I also completed another quilt top for "Quilts for Boston". 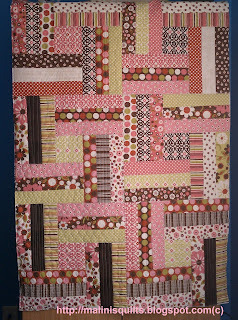 I am hoping to get this one quilted next week. Now linking up to Lee's W.I.P. Wednesdays for this week. This quilt was quilted a while ago but I never I got to blog about it. Probably I finished quilting this in 2nd week of June just in time for our June meet@BMQG. I am still getting accquainted with long arm, but still wanted to try feathers. So, quilted feathers around the blocks and flowers inside the white squares. And stippling inside the print squares. this does create lot of texture which you can see at the back of the quilt. Overall I am happy with the quilt, thought it does look like a beginner FMQ. Will have to work on it more @the longarm.